Statistics Denmark, the central authority on all public data in Denmark, offers a great variety of data for download through their website Statistikbanken.dk. However, downloading the data straight from their website is constrained to 100.000 records without logging in to your personal account. This drastically limits the number of variables, time periods, etc. that be included in a download. Manually updating your own spreadsheet, graph or analysis with data from Statistics Denmark can therefore be a cumbersome and time consuming task. At Inviso we have therefore created a macro that lets you connect directly to all tables in Statistikbanken without logging in. Using the macro, you can download unlimited rows and include all available variables!Simply drag&drop the tool onto the canvas, select the table you wish to download and click run. It's that simple. Though most of the tables only takes a few seconds to download, and though having a vast amount of data is awesome, there are instances when downloading millions of rows can take 5-15 minutes. We have therefore added the option of customizing your dataset by selecting which variables you want to include in your download. 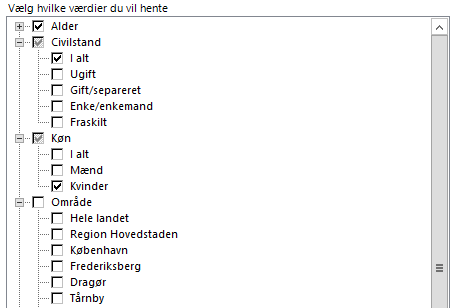 The Invsio Statistics Denmark Connection Tool (DST Macro) is now included in theInviso Macro Pack for Alteryx which is available for free.